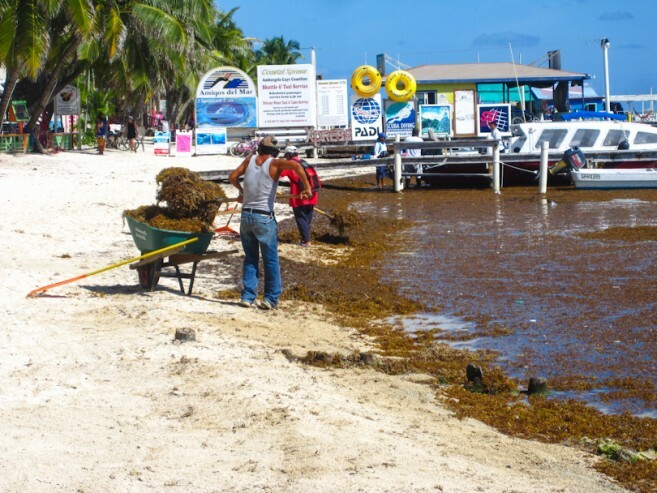 The sight and stench of decay from the tons of sargassum that continues to wash up on Belize’s beaches are not only becoming unbearable, but it is also an unexpected expense for some local municipalities along the coastline. The first time sargassum began washing up in such large quantities in Belize was in 2014. The amount in the early part of 2015 surpasses those from last year. 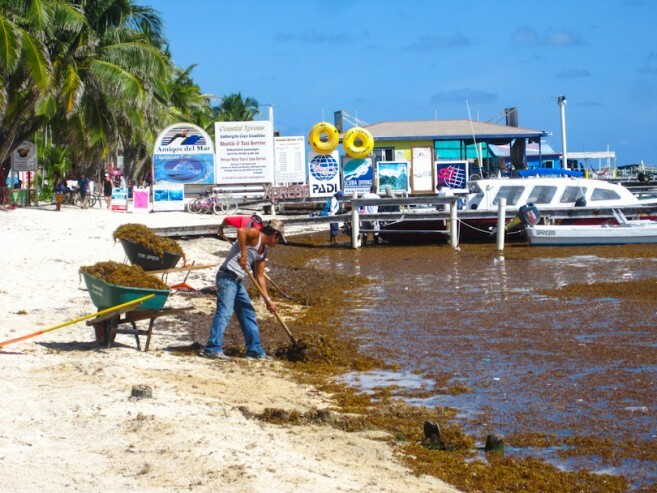 While it is an inconvenience that can affect wildlife and residents in urban coastal communities, for the marine life and the ecosystem, the large amount of sargassum may have its benefits. 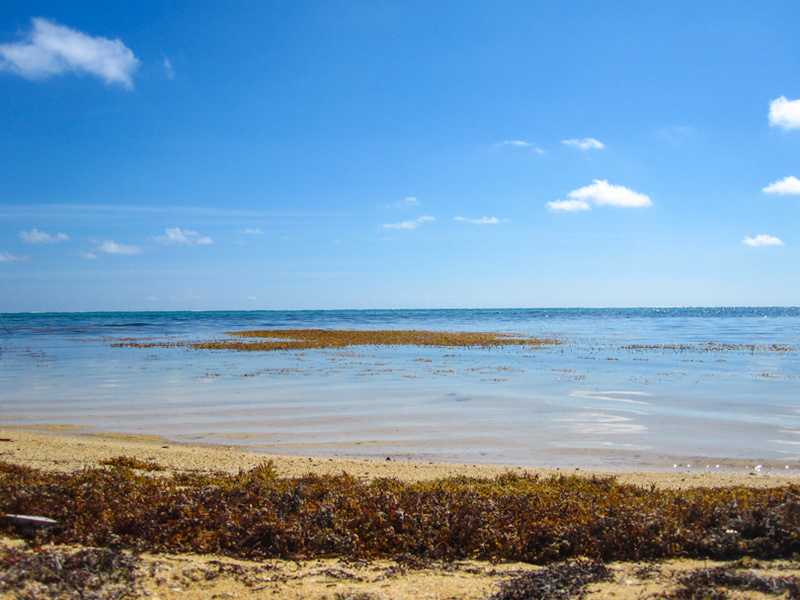 According to the local municipality in San Pedro Town, tons of sargassum has been washing up on the beach daily. 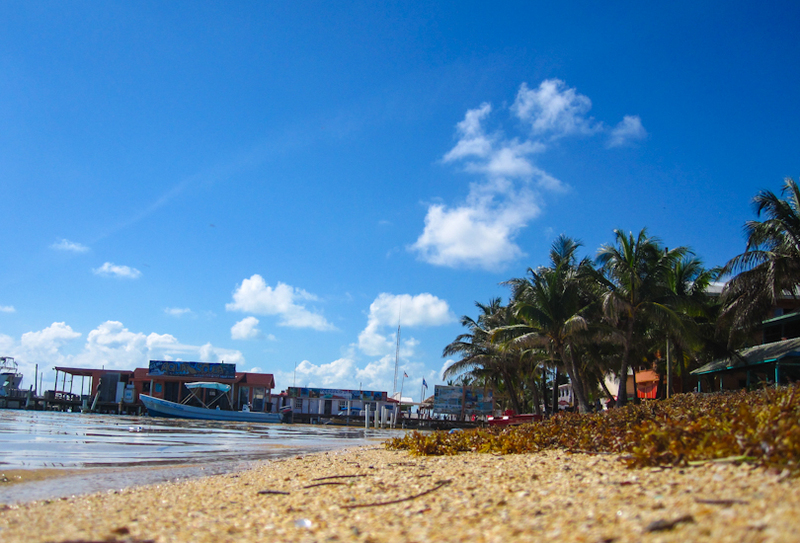 “It is just too much to deal with,” said Mayor Daniel Guerrero who explained that sanitation workers have been working around the clock to remove as much of the sargassum as possible. In some areas of the island, sargassum extends up to 100 feet from the shoreline. 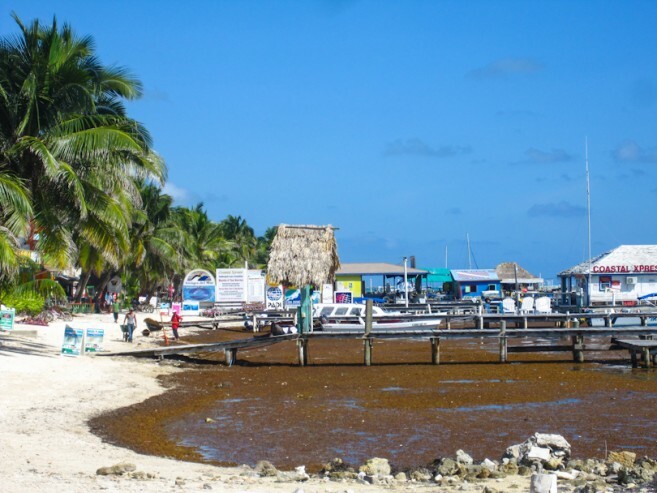 The large amount of sargassum is not only washing up on Belizean beaches but in many other Caribbean and Central American countries, as well as in the Mexico and the US. But what is causing such excessive amounts? That’s a question everyone in the region is asking, prompting marine scientists to conduct full studies into this unexpected phenomenon. 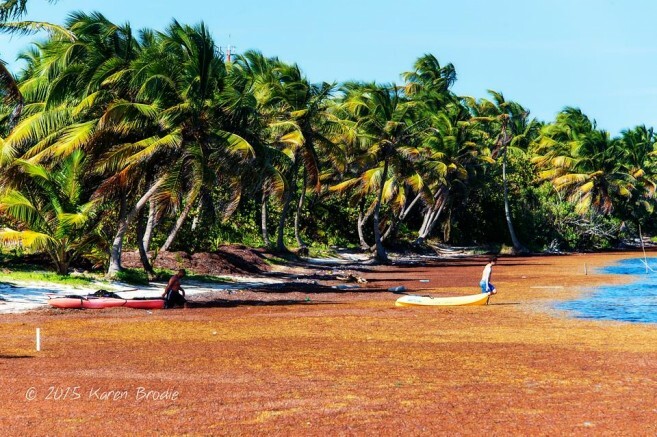 Harbor Branch Florida Atlantic University scientist Dr. Brian Lapointe has been studying sargassum since the 1980s, and in an interview with The San Pedro Sun, indicated that they are looking at the possibility that the sargassum is being fertilized. Their hypotheses is that sargassum is responding to excess nutrient supplies, thus affecting its productivity and growth rate. “For example the Mississippi River is delivering a lot of nitrogen and phosphorus into the Gulf of Mexico… we call this the sargassum continuum, because we believe a lot of the sargassum grows in the gulf and goes into the Sargassum Sea and ultimately into the Caribbean… We knew that these plants would respond to an increase in nutrients, and of course our hypothesis is that in fact, this is what is happening. This represents an ocean scale eutrophication, which in scientific terms means the buildup of organic matter in the coastal zone or ocean from nutrient input. ” said Dr. Lapointe. Scientists such as Lapointe also believe that the dispersants used in the cleanup of the Deepwater Horizon Oil Spill of 2010 may have also enhanced the growth of sargassum. But is there a possibility that excess sargassum on the beach can affect wildlife and humans in urban coastal communities? “When sargassum washes on shore the impacts can be severe, not only for species such as baby turtles, but to other wildlife. Large amounts of sargassum can produce nitrogen sulfide, a toxic gas that can affect wildlife on the beach and humans in closed communities. These are similar concern to sewer pollution,” indicated Dr Lapointe. The decaying vegetation in the water also produces several bacteria and other microbes that can cause serious skin irritations and other skin problems. It is recommended that humans keep away from where large amounts of decaying sargassum are found. However, Sargassum is an excellent form of land fill, and as such the council has been removing the material and giving it to residents who need it to fill their properties. If left alone on the beach, it can help rebuild eroded beaches. However, residents are advised that when decaying it produces a putrid stench that is unbearable to humans and can produce toxic gasses. So how long will the sargassum keep washing up on the shore? No one knows for sure, since scientists have seen a change of pattern from being seasonal, to longer periods, to all-year-round in various parts of the region. For the time being, residents will have to continue bracing for more sargassum.